PS, I don't think I've ever vaped beyond 35 Watts. Well when I worked in a lab (I am retired now) I use to have access to test equipment that I could test them. And you could push them way pass their specs most of the time. And without the equipment, I would try it and monitor the temperature and check for any voltage drop. For vaping, normally you would never draw more than 20 seconds tops. So even check for 20 seconds. No voltage drop nor any heat, I'd say you are good to go. Gee they want 10 bucks for those switches nowadays? Geez. Inflation is a bummer, Bill. I remember gas, high test at that, at .239 a gallon. What happened to that? Or is this just crazy talk lol? ps Bill, my draws range from 2 to 6 seconds. Any longer of a draw and I'd probably pass out lol. That's over the top, but a fun plan. Are you going to make it a desktop mod? Maybe a DNA 200/250 Hubbly Bubbly Hookah? Please post pics, if you make one. TX - definitely not something I'll carry around, more like a "leave at work" thing lol. Below 3.7 volts it doesn't fire, and it's hard-wired to stop at 4.2 volts. Also hard-wired to never go beyond 30 Watts. How might that look without a circuit board? Shawn, unless I'm missing something key, the toggle style switches you are looking at are double pole switches. Looking at the data sheet it looks, to me. like it won't do what you're trying to accomplish in terms of switching. If it did it would list something like 1-2 ON, 3-4 ON, 5-6 ON depending on handle position. What you're actually looking for is three single pole switches mounted in one enclosure and controlled by a single bat handle. The best solution for that would be a either a single or double pole, three position, rotary switch and, again, current capacity and resistance of the contacts is a real concern. You're dealing with some, potentially, high current especially when Mr. Murphy gets into the mix and a coil gives you fits. The DNA chip will control power, and hence voltage and current, based on the resistance of your coil. Whether that control is based on a voltage setting or a power setting has no bearing on the situation for vaping as far as I can see. Whether the desired result is achieved by setting voltage to achieve a power level or simply setting the power level, directly, the result is the same. Additionally, if you use the TC mode, it will control that quite closely for then entire draw. The opinions expressed are worth exactly what you're paying for them, no more, no less. Thanks Awsum. So something like this? As for current, I have a Melo 3 mini, and vape it at 50.6W/3.7V and have never gone over 13.x amps. Everything else I vape is between 15 and 25W at 3.7 to 4.2 volts (I never go over 4.2 or under 3.7), i.e. not 'hot'. I don't really want to throw a rotary on for "atty toggling" because it loses a bit of the cool factor to me lol. I've also come to the realization that I want to build two triple-attys, one mechanical with voltage control, and one using just the DNA75. 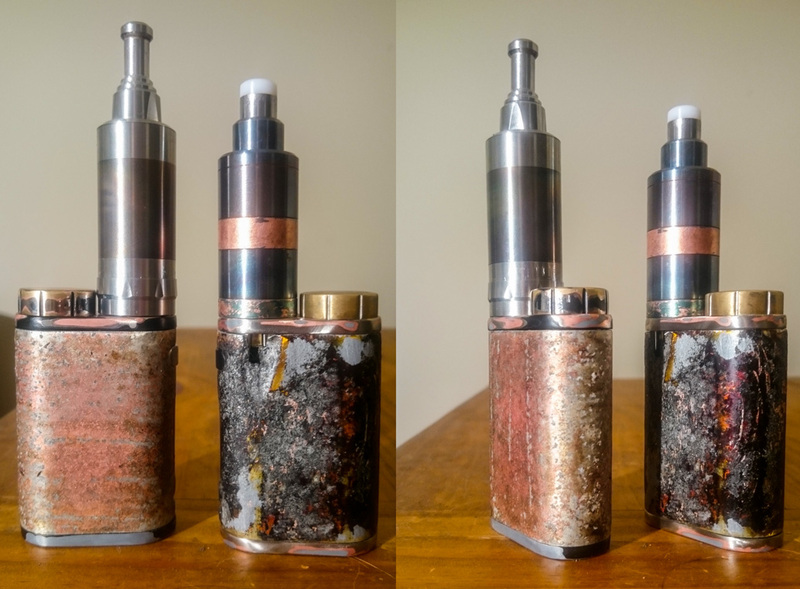 Ultimately, I'd like to build these for fun (normal, 1 atty mods), so right now I'm trying to build the crazy one in my head as a way into learning and having fun. That is the same type of switch as the Honeywell you posted earlier, 3 position DPDT. You still would have to add the jumper that I showed you to convert it into a SP3T. The Honeywell being rated for more amps. Basically these switches have 3 positions. Both contacts up, both contacts down, and in the center position one set of contacts go up and the other set go down.